The volunteer (Read This: UNPAID) moderators of the Facebook group try tirelessly to keep it free from scammers, dishonest members, rude bullies, and those who do not follow the rules. But we can not possibly catch or prevent everything. So ALWAYS be safe and take care of YOURSELF! 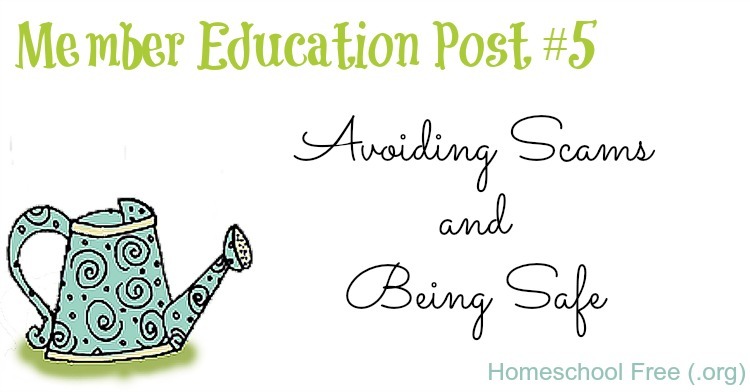 Read the policies and safety measures detailed at www.homeschoolfree.org to know how to conduct business within the Facebook group in the safest manner possible. more than four to six weeks has passed and you still haven't received the item (via media mail). If shipped Priority or other method, wait up to two weeks before worrying. the donor has left Facebook, or has been put on Facebook "time out"
you search the donor's name within another Facebook buy/sell/trade group and find out they've scammed someone else. We ban like crazy in the Facebook group. We try very hard to keep the integrity of the group members' interactions to a very high standard. We pride ourselves in being known as a fairly drama-free group, and have a long list of banned profiles. We keep in contact with other buy/sell/trade group moderators, and even ban/block folks who have a reputation of being dishonest in other groups as well. Haters may hate, but we're proud of the fact that our members are protected to the best of our ability. If you have been scammed, it doesn't hurt to report profiles to Facebook AND Paypal. Please do that right away! Paypal will cancel their account after they receive too many complaints and that will severely limit their success even IF they use another profile to re-enter our group. However, for serious offenses, you also have another option that you may not be aware: The Internet Crime Complaint Center which is monitored by the FBI. It can be assumed that if someone is reported there, especially after several times from different folks, they should be stopped. Help us (and other Facebook group moderators) out. Let's get 'em!